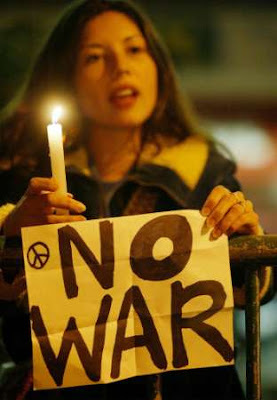 CRIME, GUNS, AND VIDEOTAPE: Where Are All the Anti-War Whiners Now? Washington, DC—Let me be the first to admit as a staunch libertarian Conservative I was no fan of Either Presidents named Bush. They being pretend Republicans and progressives got us into three wars if you count Iraq twice. I’ve never personally approved of these undeclared deadly wars without end. I watched the Leftist fringe demonstrate somewhere and whine for TV cameras every week, throughout three Bush Administrations. They cried, "Impeach Bush!" at every opportunity. They were relentless and redundant, that is until their Messiah took up residence inside our Whitehouse. Now with Barack Obama we have three wars and today he’s saber-rattling for yet another war with Syria. Obama is now bulling President Bashar Assad threatening sanctions if he does not surrender his political power. I’d like to think that so many American parents are tired of their children being sent home in rubber bags or with missing limbs along with life-long disabilities. The goal of separating good Muslims can never be met until every last one of them is dead. But now the Anti-War Whiners are all nowhere to be found and I can’t figure out where they have gone. "But now the Anti-War Whiners are all nowhere to be found and I can’t figure out where they have gone. " They are sitting on the sidelines because there is Dumbocrat in the White House and the moment a Republican is sworn in they will be out in force once again.